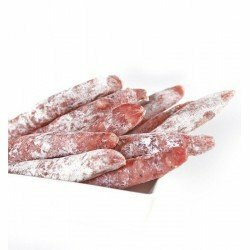 The salchichón is one of the most traditional dry sausages of the Iberian Peninsula, a tasty product that, when made with quality raw materials, results in a delicious and very easy to taste. 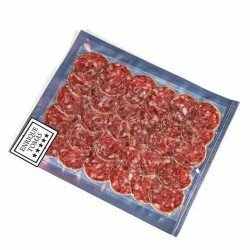 That is why at Enrique Tomás, as lovers of the quality products that we are, we bring you a selection of Iberian and acorn-fed sausages 100% to delight you, perfect for those who like to enjoy a quality sausage, full of nuances and ideal both for eating on a table or sandwich. 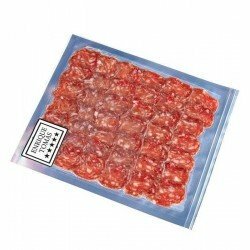 Elaborated with Iberian pigs, our range of salchichón has several presentations, half a piece or ¼ of Iberian acorn-fed piece, mix of salchichón and Iberian chorizo, our packs of 80 gr. 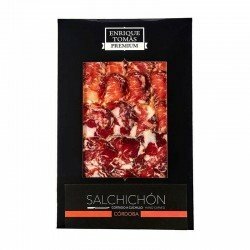 of Iberian product 100% of the best origins: Huelva, Cáceres-Badajoz, Salamanca and Córdoba cut by knife and our box of sausages and cured acorn-fed made up of ham, chorizo, salchichón and lomo of the best quality. 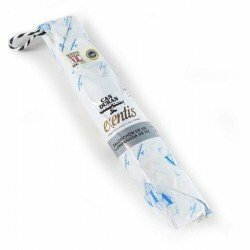 In addition, you can choose the richest sausages and fuets to enjoy a flavor full of personality, ideal for any occasion. 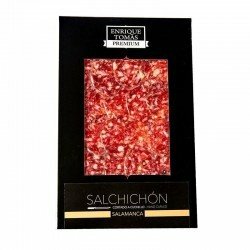 If there is one thing you can be very clear about when you buy any of our products, it is that at Enrique Tomás we only offer you hams and sausages of the best quality, because we take the utmost care of all the processes involved in making our products to guarantee you one thing: that you choose what you choose is simply delicious. And of course, the sausage could not be the exception! 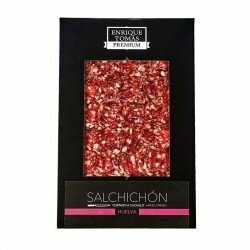 We have the best pieces from the Iberian pig and prepared with a mixture of lomo meat, bacon and seasonings such as salt, pepper and to a lesser extent nutmeg, resulting in a mixture that, after letting it rest one day, acquires taste and flavour. Then the curing, smoked or in the air, will give this sausage its own personality; that It’s why it tastes so good. 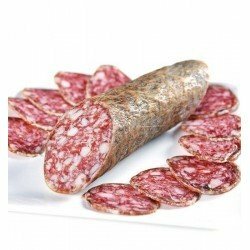 Although salchichón is an essential part of Spanish gastronomy, unlike chorizo, we don't usually cook with it, but rather enjoy it on a good sausage platter, alone or with bread in a delicious sandwich. 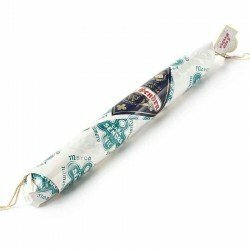 Be that as it may, the Enrique Tomás sausage is a gift for the palate, made with a quality raw material to be enjoyed in every bite. Buying “salchichón” online has never been easier! Choose it in pieces, sliced, knife cut or packaged and enjoy an incredible experience with every bite.